Miley Cyrus fans who have been around since the Hannah Montana days have seen it all – the start of her relationship with Liam Hemsworth, as well as her crazy phase and the demise of their relationship. They also saw the two rekindle and get engaged again. After years of waiting, many were disappointed to learn that although the wedding FINALLY took place, it was done very privately with barely any of the pictures to be found online, which led to fans not being able to see any of the action. But Miley had a treat for all her Instagram followers for Valentine’s Day. The songstress took to her social media account to commemorate the day of love with romantic pictures of her and hubby at their ceremony. 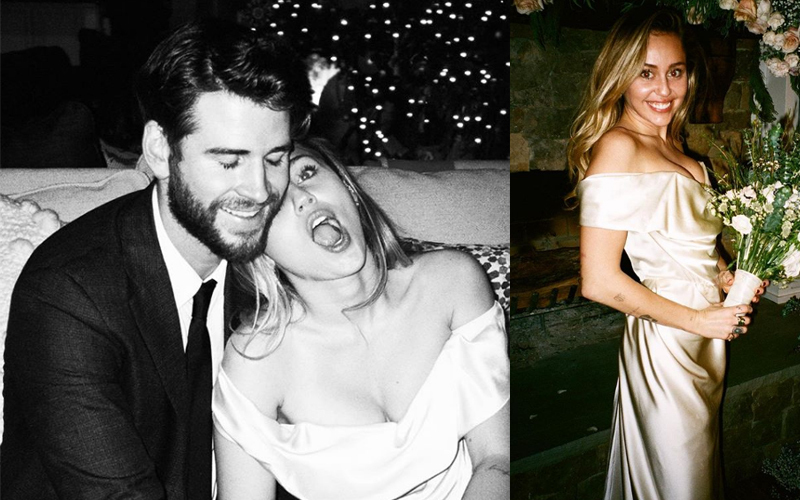 The pictures, which Miley posted to express her love for The Last Song actor, showed the couple enjoying themselves at the ceremony. Miley stunned in an off-the-shoulder Vivienne Westwood gown which she looked ethereal in, while she held white and pale coloured flowers which matched her perfectly. Liam looked dapper in a suit, and the happy couple was seen embracing in one of the picture. Miley captioned the picture, Thank you for always bending down to hug me ... I promise I will always meet you in the middle on my tippiest toes! I love you Valentine!” Awwwww!